The gap theory has come in different forms since its conception in the early 1800s. It was a response to the long geological ages that were coming to the forefront, from a naturalistic worldview of the earth’s geological history, in the late 1700s. However the gap theory is like a theological monkey swinging along on ever shortening ropes with every biblical objection put to it, until there is no rope short enough to swing from and the monkey falls down. The truth is that Genesis is the book of beginnings, with God the originator of all things. So we should not pander to a wholly materialistic explanation of things by trying to fit it into the Bible and coming up with ideas like the gap theory. For more detailed accounts of what the gap theory entails, and the many good biblical objections to it, see the related articles (listed at the end of this one) and recommended resources. However, although biblical objections to the Gap theory have long been known, surprisingly, the view is still widely held. After creation talks with open question times, I and other CMI speakers still encounter people asking if there is a gap between Genesis 1:1and 1:2, or between 1:2 and 1:3. In my experience, most people don’t really understand why there would be a gap there, and all the particular nuances of it. Rather, it is something that they have heard about, which they then use it as an excuse not to take the Genesis timescale at face value. They believe instead that the purported billions of years can be fit into this alleged gap. I would like to look at Genesis 1:1–3 from a different angle, from a non-technical angle, by comparing Scripture with Scripture. That is by examining the structure of the narrative (how the story unfolds), as it is often easier to see things clearly when the pattern is repeated elsewhere. Genesis 1:1–3 is a historical narrative and comparisons can be made to other biblical passages written in the same style which can help us understand what is going on, in this instance with Genesis 13:1-3. Specifically, there are grammatical terms, called the waw consecutive and waw disjunctive, used in both of these passages.1 Since most readers can’t read Hebrew and distinguish them, I will explain using English translations of the verses in the table below, showing the structure of the narrative. In Genesis 1:1 we have the beginning of the story in which God creates all time (beginning), space (heavens) and matter (earth)—in other words the universe. The Hebrew language has no single word to describe the universe; thus a merism is used. Genesis 1:1 is a merism with “the heavens and the earth” used together; it is also sometimes referred to as the idiom of totality. The “heavens and the earth” combine together to inform us that all the material in the universe is created at this point; “the words cannot be understood separately but must be taken as a unity.”3 A further example of a merism can be seen in Psalm 139:2 when King David declares to the Lord, “You know when I sit down and when I rise up,” indicating that God knows not only those exclusive actions but also all the others in between. 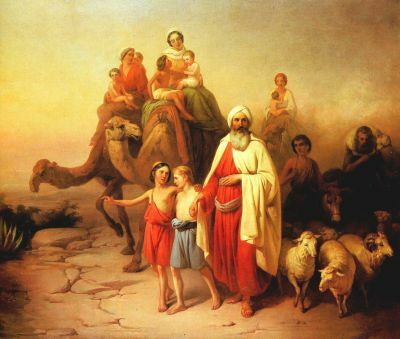 In Genesis 13:1 we also have the beginning of a new historical narrative, a journey for Abram and his family. This begins after an encounter with Pharaoh in Egypt, after which they leave Egypt and journey into the Negeb (i.e. what modern Israelis called the Negev Desert). In Genesis 13:2, the story of Abram also takes a side-step in which it describes Abram’s status to us at that time, informing us that he was rich in livestock, silver and gold. This is again indicated by the waw disjunctive, as in 1:2.6,7 Abram’s prosperous state in Genesis 13:2 was tied to his stay in Egypt, referring back to Genesis 12:16 and Pharaoh as the originator of these goods,8 not his journey. In Genesis 1:2, a description is given of the earth which allows us to understand that it was included in the universe that God had created in verse 1. It is an elaboration and description of what was included in the universe, which then allows the narrative to continue with God then forming and filling the earth in the rest of the first chapter. This is also the case in Genesis 13:2, with its description of Abram being rich at the start of his journey into the Negeb. This provides the background for the separation between Lot and himself, because the land could not support all the livestock that they both owned. In this way, the side-step and description allows the unfolding of the narrative to continue and make sense in both cases. In Genesis 1:3 we then have the continuation of the story from Genesis 1:1 with God creating light where there was no light before, in a dark universe. Likewise in Genesis 13:3 we can also see the continuation of Abram’s journey from Genesis 13:1 which is directly picked up again.9 John Calvin notes, concerning verse 3, “In these words Moses teaches us that Abram did not rest until he had returned to Bethel, for although he pitched his tents in many places he did not stay there permanently.”10 He returned to the last altar that he had built in the land of Canaan and called on the name of the LORD after his disastrous time in Egypt. Of course, by understanding the geographical context ofGenesis 13:1 and 13:3 it must have taken Abram a certain amount of time to travel from Egypt up through the Negeb to between Bethel and Ai, but this is one journey and the time is contained within the verses, not between them.11 Both texts flow in a continuous narrative from the first verse to the third verse with no gap between them. By simply looking at the structure of the narratives of Genesis 1:1–3 and 13:1–3, even in English, we can see a common pattern. The narratives’ beginnings in verse one, the side-steps taken in verse two, and the continuation of the narratives in verse three. Verse divisions greatly aid memorization and help Bible students to find parts of the Bible very quickly, but they are not part of the original inspired text and should not be treated as such. Unfortunately, the artificial system of verse numbering might give the impression that there is a break between v. 1 and v. 2. But the original Hebrew readers would not have had such a division before them, so they would have fully understood the natural flow of the text in Genesis 1:1–3, as they would in Genesis 13:1–3. The verses are not separate entities and should not be treated as such. So, comparing the structure of the narrative in Genesis 1:1–3 to Genesis 13:1–3 should demonstrate that there is no room for a long time gap. A gap between any of the verses would destroy the structure of the narrative. Thus the gap theory was forced into Genesis from outside ideas—long-age geological uniformitarianism—things foreign to the structure of the narrative. Painting by Jozef Molnar, 1850. Abraham’s Journey from Ur to Canaan. All long-age ideas, including the gap theory, are theologically inconsistent with the Bible, the Lord Jesus and the Gospel. Thus gap theorists should renounce this idea, not leaning on their own understanding but in all their ways submit to Him (Proverbs 3:5–6). We should give our glorious God the praise and glory for creating in his own described manner and defend the straightforwardbiblical creation teaching against attempts—however well-meaning some may be—to water down the Bible’s plain meaning. To do otherwise is a failure to see the dangers of naturalistic attempts to explain the Creation, such as those found in the fanciful fairytale of evolution and all that it entails. Waw (pronounced 'vav') is simply the Hebrew word for ‘and’. When it is part of a verb (waw consecutive) it advances the story and moves on the action. When it is put in front of a noun (waw disjunctive) it gives extra information to help us understand the events which follow. Return to text. In other bible versions, this is translated “the south”. Return to text. Waltke, B.K., Genesis: a Commentary, Zondervan, Grand Rapids, Michigan, p. 59, 2001. See our review. Return to text. Both Genesis 1:2 and Genesis 13:2 start with a waw disjunctive introducing the parenthetic statement—the side-step and description of the object or person in verse 1. Return to text. Morris, H., The Genesis Record, Baker Book House, Grand Rapids, Michigan, 35th printing, p. 48, 2001. Return to text. Classic.net.bible.org states, “This parenthetical clause, introduced by the vav (ו) disjunctive (translated “now”), provides information necessary to the point of the story,” accessed 29 June 2013. Return to text. Dr Gordon Wenham comments that Genesis 13:2 is a “Verbless circumstantial clause, a parenthesis supplying background information.” Wenham, G.J., Word Biblical Commentary Genesis 1–15, Nelson Reference and Electronic, Nelson Publishers, p.293, 1987. Return to text. Currid, J.D., Genesis Volume 1, Genesis 1:1–25:18, Evangelical Press, Darlington, England, p. 265, 2003. Return to text. Both Genesis 1:3 and Genesis 13:3 start with a waw consecutive, showing the continuous time sequence of the story from verse 1 in either chapter. Return to text. Calvin, J.; Eds: McGrath, A. & Packer, J.I., Genesis—The Crossway Classic Commentaries, Crossway Books, Nottingham, England, p. 119, 2001. Return to text. The Bible does not state where in Egypt Abram stayed. However as a rough estimate, from the centre of Egypt to Bethel (modern day Beit El) and Ai (the ruins are thought to be at Et-tell), the journey which is mentioned in verses one and three may have been around 300 miles. Return to text. Old Testament verse divisions come from a verse numbering system created by Rabbi Mordecai Nathan in 1448. The 1560 Geneva Bible was the first English Bible to use a verse numbering system. Return to text. See for example Sarfati, J., ‘Just preach the Gospel!’ Creation, 35(3):15–17, 2013. Return to text.